Bought a Raspberry PI board from Adafruit. This is a small ARM based complete computer for <$40 with a bank of general purpose IO pins, like an Arduino. It runs LINUX from an SD card. The point is this is a more powerful prototyping platform than the Arduino. I'm not totally sure what I'll use it for, it is a toy to start with. I decided to go mainstream and get the PI but there is some other interesting stuff out there. The android OS appeals to me, since I already know how to write Android apps. This one has an add on breakout board for IO, but says the example code "will be released". The company website is half in Korean. I'm sure it is great but it could end up being a major headache and hours of non fun debugging software and getting unsupported stuff to work. No thanks. The forum is dead. Can only buy the new rock board from them. It also needs a >4Gb micro SD card. I chose a class 10 16G to try to keep the disk write time to a minimum. 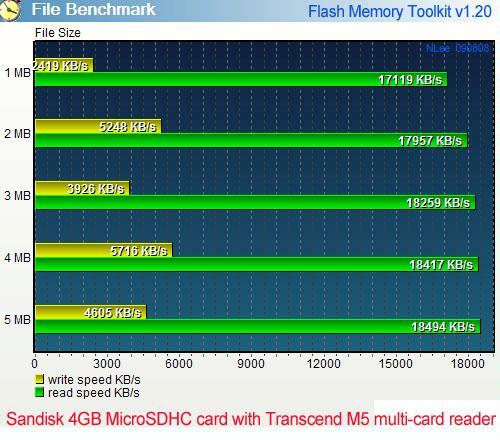 It takes some digging to figure out what SD cards are faster. Retailers don't always show the speed. 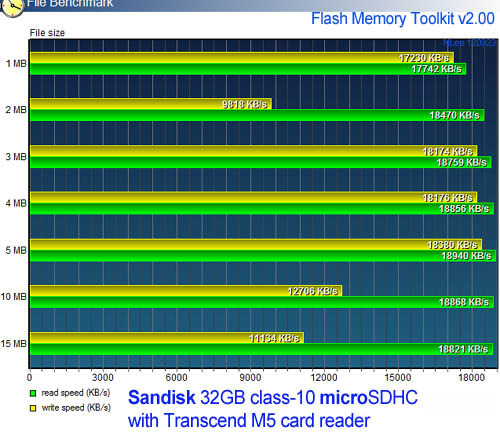 I stuck with SanDisk, having worked with them in my real job they are a reputable company and they try to meet the specs they claim. Not as cheap as you'd think. I probably have a phone charger, HDMI cable, USB keyboard/mouse I can use. But if I had to buy all that I'd be over $100. Internet connected appliance that moves something depending on web info like stocks, weather, user commands. Connect to webcam and do some image processing function. Drive my laser light show, the Arduino wasn't making the rate I needed. 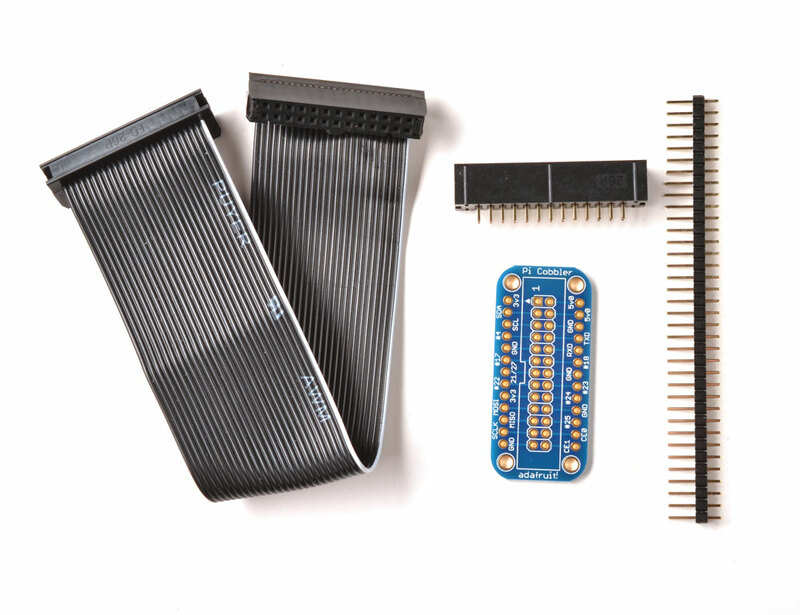 Looking for some examples of how to use the GPIO to communicate with the real world. Downside seems to be that it is 3.3V logic, not 5V, so interface will be different. Less voltage for some analog interfaces. Programming appears to be in Python or C. I haven't used Python, and I'm hesitant to learn yet another coding language. It appears I can use C and linux command line. I'm hoping this doesn't turn into being a software exercise that slows down the hardware fun! "To use an image file, you will need to unzip it and write it to a suitable SD card using the UNIX tool dd. Windows users should use Win32DiskImager. " unzipped the diskimager and the wheezy download zip file. Ran the diskimager exe and pointed the diskimager at the unzipped .img file and the new 16Gb SD card and hit write. It took a few minutes and said done. Now the SD card can't be seen by the PC anymore. I suppose that is normal but I was hoping that the SD card could be a way to transfer files back and forth. Got the raspberry PI in the mail. Plugged in the SD card I formatted above. Plugged in the USB cable to a phone charger, used an HDMI to DVI adapter cable to plug in a monitor. Plugged in a USB keyboard and mouse. Ethernet too. Voila! It booted right up to the desktop after one setup screen. I can surf the web. Here is the screen with the desktop and linux terminal and the browser open, it was able to see the internet with no effort whatsoever. I'd like a virtual keyboard so I don't need the USB keyboard. I connected an LED and 2.2K resistor between the 3.3V power and GPIO 4 on the header and I wanted to light it up. Flailed around alot with GPIO examples, not reading carefully, trying to download stuff and failing. I learned that I needed to do a software update to my Raspberry PI OS because all the app-get commands were failing. This turned out to be key, even though I just imaged the disk straight from the RPi website yesterday. Now the instructions in app-get have started working. Now the commands gpio -v, and gpio readall are recognized! Looks like he numbers the pins differently than the previous examples, but at least combines a table showing all the numbering schemes. The pin I'm using is pin GPIO7. I flailed a bit until I did things in exactly the correct sequence. And the LED lights up! W00t! This was a bit frustrating up to this point, mostly because the steps weren't really spelled out and I didn't do things carefully and the gpio commands don't complain when you type the arguments all wrong. 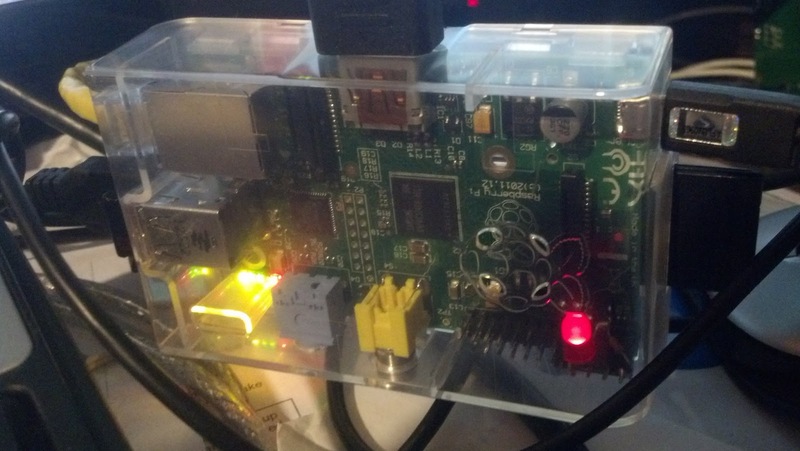 Here is the Raspberry PI in the clear box, lots of wires sticking out of it. In the lower right you can see the red LED is soldered to a small connector and plugged into the GPIO pins so that it is connected between +3.3V and GPIO7 (or 4 depending on who is counting). The blink script is running and turning it on and off. I modified LED to output on pin 7, like my bash script. From the users home directory where the cblink.c program is sitting I ran it. And hooray the LED starts blinking, just like my bash script earlier!!! Win! I don't really want to go with a fixed IP address as he describes. I'd much rather set up a system where the remote control and the raspberry pi find each other on the network. 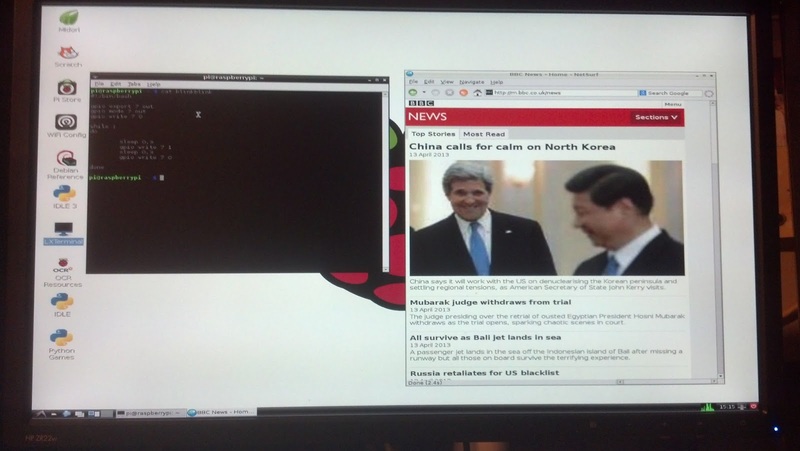 - do a kind-of Remote Desktop (Windows style) via a VNC server on the Pi, and a client on Windows. There's Ultra-, Tight-, True-, and plenty other VNCs for that, all with versions for windows, Linux (lots of flavours), and plenty other OSes, it is very standard. Be aware though that VNC does bitmaps, not vectors, so a lot more data needs to travel between the sever and client. Redraws are slowish and ugly. - do a true Remote Desktop from Windows, using Windows RDP protocol, thanks to FreeNX server on the Linux machine. Vectorial, hence much faster and pleasant. - take advantage of X11, which natively supports displaying one PC's stuff on another. Most Linuxes' user intefaces (lxde, gnome, KDE...) use X11. But Windows doesn't really have it, and getting it to run is a pain, the best solution I could find was actually install a Virtual Machine running Linux on my Windows PC, and do X11 remoting from there. Otherwise, there's a whole lot of hooplah involving Cygwin that's good for giving headaches, mainly. Actually, a package and doc to enable good remoting to the Pi would be a very useful projects for those of us who do have a Windows PC. What you are looking for is FreeNX [ lacking development will not work out of the box ] NoMachine [ Commercial nothing ready for R-Pi ] and x2go. X2GO is Free / Open Source and being actively developed. It is now used with Skolelinux doing just what you are seeking. Seeing the specs of R-Pi model 'A' it is suitable. 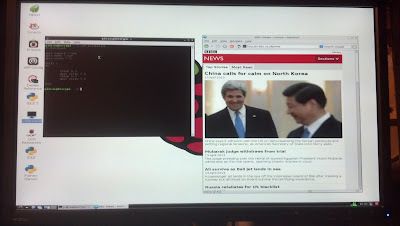 With Debian working on R-Pi x2go will also work but not yet tested. You need not learn any thing to use that x2go on R-Pi a simple log-in will do, unless you wish to contribute then do learn about Linux. basically it says ipconfig! I tried that first, I'm no noob, but it doesn't work! I get sudo: ipconfig: command not found. Whaaa? Read more carefully. if is "ifconfig" not "ipconfig"
This page describes how to scan for the rpi on the network using ipscanner and puTTY. Put the IP address above into putty and badaboom! I get a login window that asks for user and password. I try "pi" and "raspberry" and I'm in! I execute my bash script blinkblink remotely and the light starts flashing. I have a achieved remote control access! I'll need a better program on the windows side to find the raspberry pi by MAC address, but a small victory. Bought a WiFi module to plug into the PI USB from Adafruit. Page says it works right out of the box. I plugged it in. I had to use the virtual keyboard because there are only two USB. I could have dug up a hub but I was lazy. I hotplugged it and that triggered a reboot. I disconnected the ethernet cable and clicked on WiFi Config on the desktop. I didn't record the exact sequence of events, but I scanned for my network, found it. Then I double clicked on it (which wasn't the obvious thing to do) and a box came up and I was able to type the password. I'm using WPA PSK and that was fine. It connected and displayed the IP address directly. Using puTTY from my PC, I could again log into that IP address as user pi, password raspberry and I'm in. Cool. WiFi was a snap. 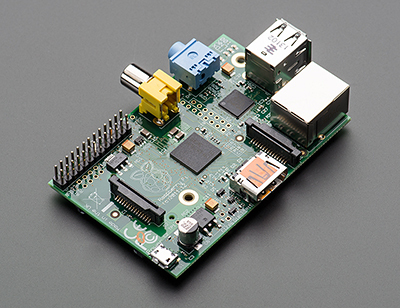 I want the rpi to communicate over the internet to either other machines or to an android app. This post has it sending email. That is nice, not exactly what I want though. This post has it pulling down messages from web sites. Although there is no explanation of how it works. Here is a good idea. Use google docs as a drop box. The pi will create and read docs. THese all use gspread to upload. no mention of download yet.